This is the Oasis Collection MiMi DSLR bag from Therm O Web. The first time I saw this bag I had high hopes. Being a, let's face it, obnoxious camera bringer-alonger, I really wanted a bag that was cute, functional, and would allow me to carry one bag, instead of a purse and a camera bag. And I am very happy to report that this bag definately met my expectations! I took the bag on a few outings this past weekend and it worked beautifully! Here is a photo of my old camera bag next to the Mimi Bag. The Mimi bag is much larger. But it is in a good way. 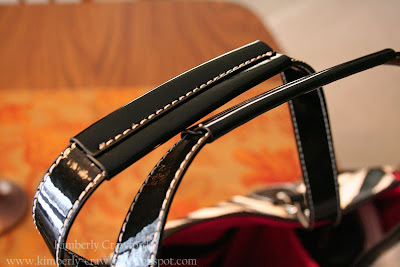 It is very similar to all the purses I carry, and I think that is one of the best features. My camera bag is so square and box-like. The MiMi bag easily fit over my shoulder, without the weird bulk. The bag has three pockets on the outside. Perfect to hold a wallet, a cell phone, or whatever little things you want quick access too. They close with a magnetic snap. The snap grabs easily, so there is no need to work at closing it. The handles are reinforced and flat in the middle. I found this made it more comfortable in my hands as I would carry the bag. Here is the inside of the bag. It has two velcro strips down each side, allowing you to move the cushioning pieces where you would like. Great feature!! This is one long pocket towards the top of the bag. My remote shutter, AV cords, and download cord, all fit perfectly inside. There is another pocket along the bottom, shorter side. My lens cleaner, extra battery, and extra CF cards fit nicely inside that pocket. One more might be nice, but these are sufficient. LOVE THIS! Look at that brilliantly designed cushion! It is made to hold your lens down!! Very smart. 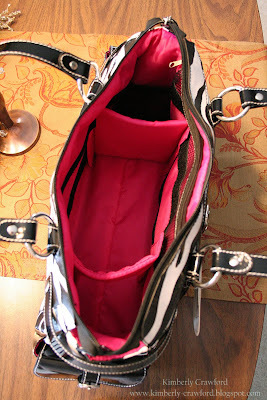 This is one of the peices that can be moved anywhere inside your bag. I was able to move this piece closer to the camera base with my 18-55 mm lens and farther away with my 75-300 mm lens. Here is a photo of my Canon AE-1 with a Vivitar 80-200 1:4.5 lens attached. Now, that camera is an SLR, but it just shows you how versitile this bag really is. It has the size to support your larger-based D-SLR, but will easily hold a basic SLR. I also have my Canon ef75-300 1:4-5.6 lens inside the other moveable cushion. There is still plenty of room for more! 1. I thought the bag would be leather, but it is vinyl. I got over it quickly, as it is a well-made bag. 2. More pockets please, for the inside. But once again, I can deal. 3. The zipper does not close the top of the bag, it hangs off each end. It does tuck nicely into the ends however. 1. Perfect to hold my camera and my normal purse stuff. 3. This is just a fabulous bag! I could not be more thrilled and I know that it will get used all the time!! Ashley Harris: I have the giraffe print version of this bag I LOVE IT! It is roomy enough for my camera, wallet, make up and whatever else I may need to stick in there. I love the removable divider feature! So great! Honestly there are no cons on this FABULOUS bag for me. I would buy this for a friend or a relative. The price is PHENOMENAL for what you are getting. What do you think? Would you like this bag? Do you have one? Is this going on your Christmas list? Share your thoughts, we love to read them! Enter a comment by noon EST on Tuesday and be entered to win your own Oasis Mimi DSLR camera bag! What a cute bag! And I think I would love the giraffe print too! Even if I didn't want to haul my camera around, this would still make a handy bag - I especially like the dividers that come with it! OOOOH! I have never even seen a camera bag that takes care of the purse stuff too! That is awesome. I am also stoked to hear there is a giraffe print :) but think the zebra with hot pink is fantastic too. I was really surprised at the reasonable price. I fully expected to reach the end of the review and sigh deeply at finding out it was unattainable, but no, this is actually for regular folk too. I am a little nervous at putting my purse stuff in external pockets that snap, and will probably end up stuffing more easily replaceable items out there, but it looks like I will have no problem arranging my goodies in a way that works for me. Thanks for opening my eyes to such a cool product. Oh this is very cute, very stylish I love it!! I just love the print and colors of this bag! It would work great for me for the same reasons you posted, I have a bulky Canon S3 IS and I really hate to carry both my purse and camera bag, so there are alot of times I don't have the camera with me when I should have it!! Love the review, thanks for posting on it! Cute bag! My current bag is pretty utilitarian - black, bulky, ugly. I'd much rather carry something this cute around. what a cute little bag. I LOVE it! I love this bag. I have a Canon 40D and I carry the Lowepro Slingshot (backpack style) 100 (or 200, I have both) depending on what I'm doing. I love these bags for short hikes or places where we're walking a lot, but I find it extremely difficult to include my purse items...(wallet, keys, cell,) and definately not convenient if I need one of those purse items. This bag looks like the solution to my everyday carrying problem...going to print the article and leave it on the counter tonight!!! Thanks for the review. I like that it's a fun camera bag that doesn't scream camera bag. It can actually pass for a purse and it looks like it can hold quite a bit of stuff including personal items. The vinyl part kind of turns me off. Does it have a shoulder strap? I would definitely want that feature. Lovely bag - far more classy than the usual square dumpy things. this looks fabulous! (i love the giraffe print, i have a purse with that on it too.) right now i have a lowepro slingsack. it's great for traveling, but i'd love something more stylish that doesn't scream "i'm a camera bag". love this bag and hate the camera bag I currently own. this looks amazing! Much nicer than my current ugly bag. Only problem would be getting my hubby to carry it!! What a great idea. Very cute camera bag. Looks so much nicer than the bulky camera bags that have been out in the past. Gotta love those dividers too!! My camera bag is so bulky and odd to carry. This would be so fabulous to win! I love this bag and would love to win because the one I have will not fit my extra lens. Oh, that is so much cuter than my current camera bag/purse combo. totally cute! and I'm so on the look0out for a cute camera bag!!! I have the giraffe printed bag and absolutely love it. When I saw it I knew I had to have it. I do agree about more pockets inside needed. This is super cute! And actually, I'm glad to hear that it is not leather simply because vinyl tends to hold up so well and I need that in a camera bag! I love the zebra print! That's just fun! That's amazing! It's even big enough to hold my TLR by the looks of it. Does it go over your shoulder? I think that is perfect especially for those of us that travel alot I rather my luggage get lost than my expensive camera LOL .. a bit much but at least I am honest. Even if I do not win I can see myself snagging that up really quickly. Hey, I'm just excited that the interior is not black! Number one way to lose stuff in a bag is to have a dark lining. Duh! Definite plus that it looks more like a purse and way less than a boxy camera bag. Good going, Mimi! This bag looks awesome. My husband is always complaining that I put our nice camera into cute bags (that don't protect it properly) so we'd both be thrilled with this. Thanks for sharing the information and the chance to win one! That looks like a great camera bag...and super cute! I am in the market for one and that price point is really good!! Happy Holidays! I have wanted one of these bags for a LONG time! I love love love them. So nice to be able to carry ONE bag instead of 2...and camera bags usually are somewhat ugly to carry around and this one is GORGEOUS!! Love everything about it EXCEPT the animal print. I am not fond of animal print and would LOVE this in black or chocolate brown. Does it happen to come that way?? OK, I am soooooooooo going to have to win this bag! I love it, and would totally put it to good use. So cute! Love that it has so much room to hold stuff. What a fantastic bag! I want one! I love the colors and the contrasting inside color just POPS! I think it would work quite well for me. I have a SLR and a conpact digital and all the accessories and spart bits an pieces too. Thanks for the review! Pardon me while I wipe the drool off my computer screen . . . Very innovative! I've never seen a purse/camera case like this and GIRAFFE?! Oh MY! I would definitely add this to my list! ooohhhh what a stylish way to carry a camera! Looks great, I think I need it now! This bag rocks! I am in <3 with this, sure beats the ugly bag that I have for my Nikon! This is awesome! What a great idea! I hate having to bring my purse AND my camera bag! That bag looks like the perfect solution and stylish to boot! Keeping my fingers crossed that Christmas will come early for me and you will pick me! LOL! It is gorgeous!!! I am all over the zebra stripes and hot pink, so much fun!!!!! I haven't seen a camera bag this chic before. Will definitely have to show this to my huuby as a huge hint! The print is adorable...and the bright pink inside is a perfect accent! Well done! I would LOVE to scratch this bag off of this year's Christmas list, courtesy of The Scrap Review!!! That would leave extra $money$ for Santa to buy more scrappy supplies instead!!!!! Thanks for the amazing opportunity to win this gorgeous gem!! OMG! It so looks like a purse! Perfect for traveling. Fingers crossed. Thanks for the review! I am so in love with this camera bag. I am bummed as I just bought a Lowepro bag this summer for my new DSLR camera but this one is a ton cuter and I think more functional. very cute bag! I could use one of these! Great giveaway and blog!!! What a great bag, and it would solve a multitude of problems when going places that you need your camera and purse. Love the hot pink! I want one!!! OMG...I have wanted one of these bags for so long!!! Not only are they functional as a purse/camera bag..they are super cute! Love the designs!!! The winner will be very so happy!! I love this bag! I love that it does not look like a camera bag from the outside and that you can fit camera lens and some purse stuff AND still look stylish! What great features! This would be a great gift to find under my Christmas tree! OMG...that is the cutest bag...I would so use it!! Putting a bag on my holiday list now...thanks for the review!!! What a cute bag!!!! I like that its not leather, then you don't have to worry about the weather. I love that it even fits your sons' camera fits too! Your reviews are making my Christmas list grow and grow!! I would love to win this bag! Holy cow! That purse is H.O.T.!! Would definitely make lugging the big camera more fun. OMG... my camera would look so cute it that! This bag is just AWESOME! I am so in need of an updated, fashionable, efficient camera bag. I'm also getting a new camera for Christmas, so now I really need one. Thanks for the review. What an awesomely beautiful camera bag! I would definitely be a fashionista should I win this camera bag! Thanks for the chance! I have the giraffe bag and absolutely love it! My friends all want one. The only think I don't like is there is not a shoulder strap. It is a very functional and not to mention cute bag. I soooo need this bag! For two reasons..... It's adorable number one and number two, because the bag I was carrying my camera around in, the strap broke and BAM!, it went crashing to the floor! I was so sad, but it still works!! Very stylish bag!!! That is great when you are trying to "single bag it". I like the pink inside..not only because I like the color, but becuase a lighter color lining make the contents so much easier to find. I would be temped to use this bag as my purse, and just adding my camera when needed!! Oh wow I so want this!!!! Please pick me;) This is better than the Miche bag that I covet! Oooooh! Great bag! Looks so handy to bring the camera along, and I could see tossing a diaper and some wipes in too and I'd be all set! Thanks for the chance to win! Ooh, this bag looks terrific! I haven't been happy with my bulky camera bag, but don't have enough gear to move to a backpack...this looks like the perfect solution! Thanks for showing all the photos, especially of the inside! Hmm, I don't have one! Thanks for the chance to win! OMGoodness!! This would be so totally fabulous. Thanks for the opportunity. 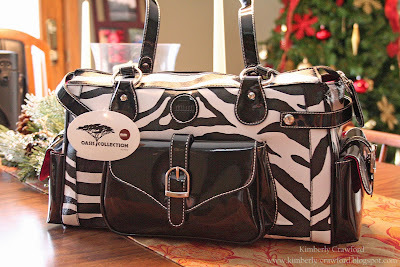 Love the giraffe print, the roominess with the convenience of carrying purse stuff too. Love to have one. Wow! I don't have one, but would love to try it out! It looks fabulous! Love the versatility of the camera/purse!. Thought I was the only one out there still using a 35mm camera! Thanks for the chance to win! Looks like a great bag and not just for the camera....I'd love to have one! Stylish AND practical! What more could you want? I want one! This is a great idea and would solve my issue of 2 bags! Looks like a great bag - I hate to carry two bags with me to every event, so this may just be the one to have! What a gorgeous bag! Really like the pink liner! This is so going on my Christmas List!! I love that you can carry regular purse items with your camera and not two bags!! Cute bag and love the hot pink lining!! I really would like a bag that could double as a purse and camera storage. It can be so annoying to carry everything when you go somewhere. Thanks for the review! That is a cute bag! I have often wondered about these bags, so thanks for the review! I have a custom made camera bag, and I like it, but it's not really big enough to use as a purse AND a camera bag. I LOVE this one. Too cute! This looks like an awesome bag. I love the print and your little man is right--the pink inside is pretty! I really love the design of the bag. Perfect size and shape to hold all essentials - camera and non-camera - without having to carry an extra bag. Oh my, what a gorgeous bag. I want one of those. SO much nicer than the plain boring camera bag I have now. Thanks for the great review. So much more trendy!! Love it. Thanks for bringing it to my attention! I definitely would put this on my Christmas list! I probably would put two, one for my camera and one for my everyday bag. The print is to die for. WOW that is super cute. I just bought my 1st Nikon and I still don't have a case. I would have to agree with all the pros and cons. I need a bag big enough for purse stuff and camera and I also carry my video camera so this would be great bag purchased or won!! Nice review! I am loving the photos. It really gave me an idea of how my stuff would fit into it. I am sure I would love this bag. I have a fabulous bag sort of like yours Kimberly so if I'm going on a big shoot, I take it. But for school trips, day trips and such...The Mimi back is per-fect!!! Thanks for sharing with us. I'm off to look for these! 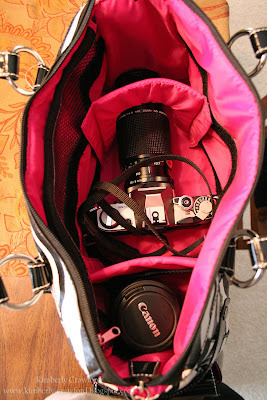 I love the idea of combining my purse and camera bag. 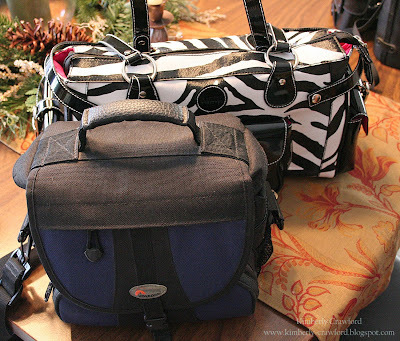 Now if only someone could throw a diaper bag into the mix, I would be one HAPPY mama! I have had this bag and have been using it daily for about three months or so... so here is the skinny-and what you won't know with short term use. 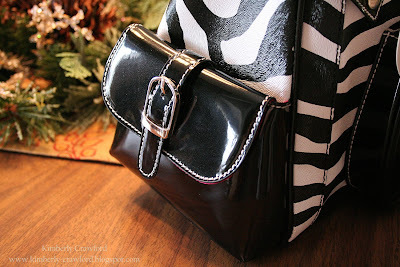 Also the slick black of the zebra stripe bag is subject to pretty easy scratches and scuffs. I think this would be less apparent with the giraffe bag, as this bag has a rougher texture to it's vinyl. I plan on contacting the company about a new bag, because 3-4 months for $70 is just not enough wear for the money IMHO. I LOVE the design of the bag... it is a fabulous everyday bag and camera bag in one... if I took my wallet and other items out, it would definitely fit my other two lenses. 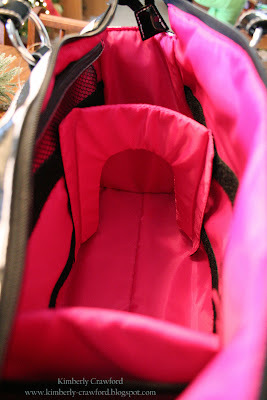 And the outside pockets are a good size for filters and battery chargers and batteries. The biggest outside pocket I have my sunglasses case and a few other "essentials" in and they fit perfectly. So on functionality & design, I give it a thumbs up... on long term wear, it DEFINITELY needs improvement!! What a FAB bag!!! Perfect!!!!!! my daughter just brought a bag home from NY and this rivals it in every way !! one small difference...hers doesn't hold a camera!! what a great idea !! This is such an awesome bag. The review was so informative, left nothing to wonder "does it have this or that". Great review! It looks like a great bag. I also like how it is long instead of boxy. And it's not as expensive as I thought it would be! I would love to have this bag. So cute & stylish. I currently have the same as Kimberleys old one. Not so pretty! This is exactly the kind of review I was looking for - perfect timing! Here's to hoping I get lucky! I have a standard, useful DSLR bag but this would be great for going out somewhere nice! Like weddings especially. Looks like a neat bag! Adorable bag! I've been looking for something just like it. Stylish + functional=love. Cute bag! It's about time there is something stylish for SLR bags. WOW! that bag is SUPER cool!!! I will be adding it to my list! ohhhh that camera bag looks fabulous!!! Would love to tote my cameras around in style!!! Great review Kim!!!!!! Wow, now that is a camera bag that I wouldn't mind carrying around. I bring my camera everywhere with me and I do the horrible thing of throwing it into my regular bag instead of a camera bag. i'd so love to win that!!!! i'd been looking for the perfect bag too - - hope those come in plain black!!!! perfect bag! stylish & functional!! This bag is so stylish. It would be so fun to carry this and it looks very functional. Much more so than the bag I currently own, that only holds the camera. Delicious! Would love to have a bag of my own! WOW Love that bag and it is pink inside. This would be perfect for my cameras when I go to my dear friends wedding New Year's Eve and Vacation time. Thank you for a chance to win this Oasis Mimi DSLR camera bag!!!!! I LOVE this bag. I've seen it advertised before and just think it's the cutest. And the functionality is great too! Thanks for the chance to win! OH MY GOSH! That is the best camera bag I have seen! Very cool! Thanks for the review! I love it! The print is awesome esp with the pink! I could so use this bag! wow! this bag is sooo cute! My current bag is alright but it's not very secure. I'd love to be able to zip it up instead of having a flap to close it and the print is awesome! That bag is FABULOUS! I would love it. The one I have now is nothing compared to that little lovely. That bag is beautiful. Thank you for the chance to win one. I would really enjoy it. Hey, Kim! This is definitely going on my Christmas list! I've been eyeing it for quite a while, and now that you say it's good, well, then it's good! I think I'll have to use it as my purse/camera bag at CHA! Perfect! Thanks for the chance to win one!! Oooh, that looks like a fun bag! people would never guess there's a camera in there! Wow Kim! This looks like a great bag! I've been using a diaper bag- lol!! At least no one wants to swipe a diaper bag, ha ha! Great report, the bag is beautiful!! I loved the story you told of your first photo with your grandfather, what a wonderful memory and you take fanstasic photos. I love to take photos as well and always have trouble finding a bag that hold everything I need in a day. This is a great giveaway. WOw I have been debating if I need a nicer camera bag. I am starting to leave the purse at home and this would be wonderful!!!!! that bag is gorg-e-ous!! thank you so much for the chance to win! i could fit my camera AND video camera in there!! I need this bag so much! 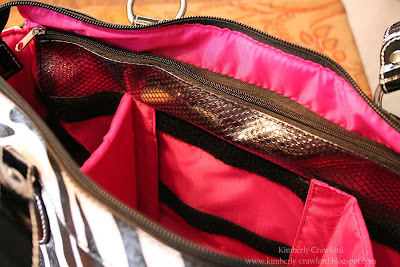 I bought a tracy joy bag last year and love it, but it's flimsy! This bag is too CUTE! I love the sturdiness and the design. I'm also a big fan of pockets, but ithunk this one is good to go. The handle looks strong and I love that it fits the Fischer Price camera too! 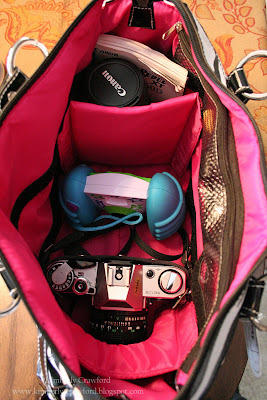 My daughter would love to have her camera in the same bag as mine. Overall, Love It! I don't have a camera bag and I love that this doesn't look like a camera bag! Would love to win one! What a cute bag. Great idea. Finally a camera case with style. Love it, let's see if Santa behaves this year. What a nice size and cute bag - I also seem to always bring the camera and hate that I have to carry two bags. i'm an animal print fanatic so....SOLD!!!! I love it! It doesn't look like a camera bag - I think I like that the most. Love this bag, much more stylish that your traditional bags and I love that it has some additional pockets on it! Wow, that is gorgeous! I would love to win one of those to put all of my camera gear in for my photography classes! Super cute bag and very versatile. Like that there is room for purse stuff too. Also love the animal print. God bless! Oohhh this is so pretty, and oh so cute!!! My favorite part, well one of them is that its pink inside...love that! It would be so nice to have a camera bag and not have to carry my purse. I the bag is so stylish. When I first looked at it I thought it was a purse. Love the pink inside. Perfect! It just made my Xmas list!!! Fun bag....and I just got a new camera that would fit nicely inside!